Welcome to Thai Noodle Etc., located in the Cedar Hills shopping mall in Beaverton next the to movie theatre. 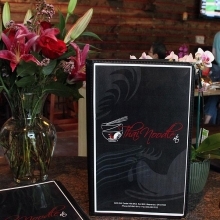 We have more than 15 years of experience in the Thai Restaurant business and have opened and ran several successful Thai restaurants in the Portland area. Why open another Thai restaurant? The answer is simple: we love Thai food and want to share our passion for excellent food with as many people as possible. We also wanted to do something different with Thai Noodle Etc. – our mission was to create a modern restaurant in a modern location, but with a traditional flavor and taste of cooking that you actually experience in the homes and streets of Thailand. In creating Thai Noodle Etc., we believe we have succeeded in this quest. …Not everyone gets to travel to Thailand, but we hope that our Thai food brings to you the Taste of Thailand and that you will share our love for Thai food with your friends and family. The Owners and Team at Thai Noodle Etc.